Why yes they are! I do repair a nail at times with wraps or acrylic but other than that they are all mine. How do your nails grow so long and not break? I dedicate most of my length, strength, and flexibility to Bliss Kiss Pure Nail Oil, which I apply directly on and let soak into my naked nails during a polish change (1-3 times per week), and I rub it on my cuticles multiple times a day, every day. I always keep polish on my nails, the free edge, and underneath the nail which adds a lot of strength and protection from accidental bumps and water. I never file the top of my nails, and I file in one direction only with a glass file . I do, however, on rare occasions, pick off my nail polish, which is a BIG no-no since it will also remove layers of your natural nail and I do not recommend whatsoever. See what base coats I use to remedy this below. Very. Carefully. (lol) Jokes aside, I almost always use several thin coats of polish. The thicker you apply your polish, the more likely it will chip or peel. The one exception is when dabbing on glitter, but a good technique to minimize the thickness is to apply it with a sponge; it will increase the concentration of glitter and the sponge will soak up the extra base. Since I keep a manicure on for a several days to a week, I always use a base coat and almost always a top coat for every manicure to increase staying power and shine. The one exception is omitting the top coat when using a textured polish. But otherwise, always always always. HK Girl - Does not shrink like Seche and Poshe, does not streak nail art, very glossy looking and dries SUPER FAST, pretty much 2 minutes later it is dry to the touch and 10-15 minutes later it is rock hard. What base coat do you use? Duri Rejuvacote when my nails are weak or brittle (such as from picking off polish) - makes then uber strong! OPI Ridge Filler when I want to smooth out my nails or have a milky base. I have also used with success: Essie Feed Me (which helps to hydrate the nail), Sephora by OPI Clear Base Coat (my first try at base coat and when my manicure did not chip for 4 days it literally changed my world!) and the discontinued Revlon 005 Base Coat, which is apparently coveted by many and 4 of which I discovered on super discount at Big Lots. But really, any base coat should do, so long as you use one! I don't recommend using a combo base/top coat, because since a base coat is meant to stick to your nails and a top coat is meant to stick to your polish, a combo probably won't do either very well. How do you clean up your nails? I use this concealer brush by E.L.F. with Lab Muffin's DIY pure acetone/glycerin polish remover. I pull the brush (as opposed to pushing) around the cuticle to make a smooth line, and if there is any polish underneath my cuticle, then I slightly push the bristles beneath them to grab it. I make sure to clean the brush on a paper towel as soon as I pick up any polish on the brush to keep it clean and effective. I also replace the brush about once a month because it gets yucky after a while, and since they are only one dollar (!) I buy them in bulk directly from E.L.F. or at Target. As I become more experienced I paint my nails much cleaner than I used to, which helps me avoid as much cleanup. I mostly use a Canon PowerShot ELPH 520 HS , but lately I have been playing around with a magnetic cell phone macro lens I got as a gift, which so far is pretty freakin' cool! 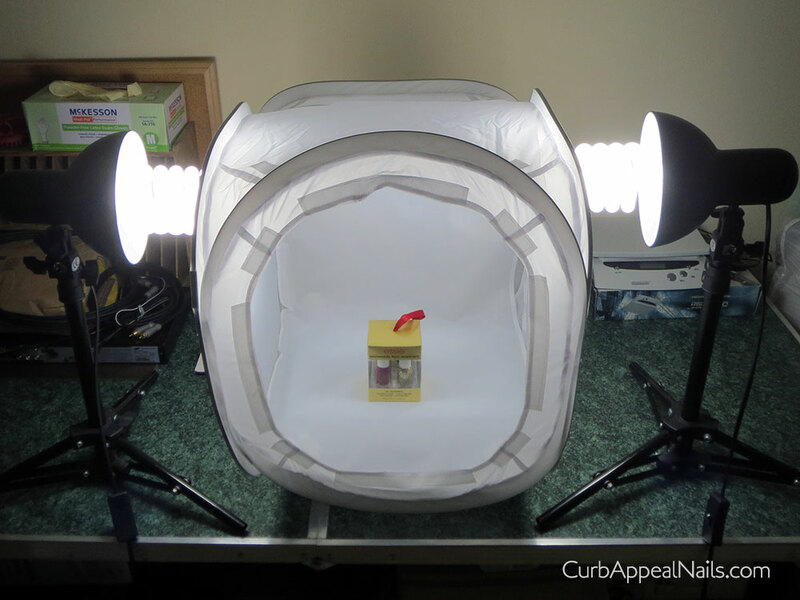 When I started blogging I was taking my best pictures outside in my front yard, but as the daylight vanished and winter came I started using a lightbox and two 60W 5500K CFLs. I still use both, depending on the weather. Got any more questions? Leave me a comment below!